The teleconference between Greek officials and lenders’ representatives scheduled for Wednesday was cancelled, making it impossible for any progress to be made in Friday’s meeting of euro zone finance ministers in Malta. According to Greek officials, the teleconference was cancelled because one of the institutions was unable to participate. The Greek government is blaming the International Monetary Fund and Berlin for stalling negotiations by putting additional demands on the table. The IMF and Germany insist on the implementation of new austerity measures for 2019 in order for Greece to reach a 3.5 percent primary surplus, something that Athens is against. Specifically, lenders ask for measures including further pension cuts and the lowering of the tax-free threshold to be implemented in 2019, a year after the current bailout program expires. According to analysts, negotiations over the second review of Greece’s bailout program has taken a political dimension as the IMF and Germany are now following a common line regarding Greece’s rescue program, a stance that goes beyond fiscal issues. Greek Prime Minister Alexis Tsipras is seeking a political solution to the deadlock. 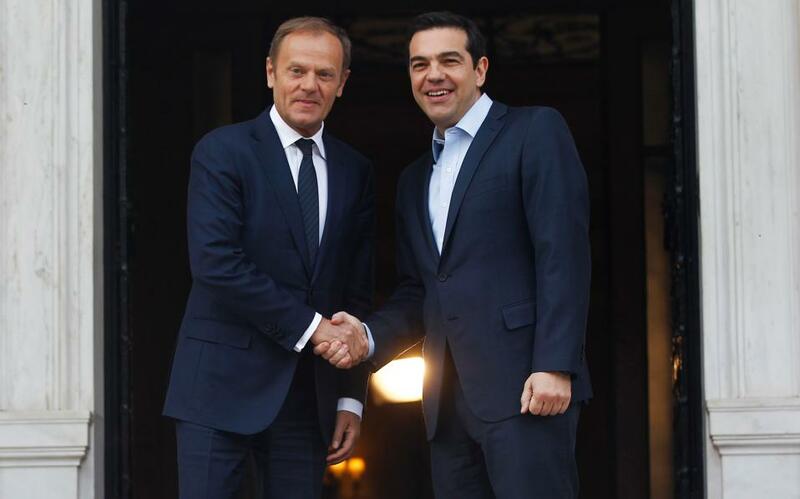 On Wednesday, in a joint press conference with European Council President Donald Tusk in Athens, Tsipras said that he asked the European official for an emergency meeting of euro zone finance ministers if Friday’s Eurogroup in Malta fails to bear any results. He expressed the certainty that his request will be granted and that a solution will come out from the emergency Eurogroup.